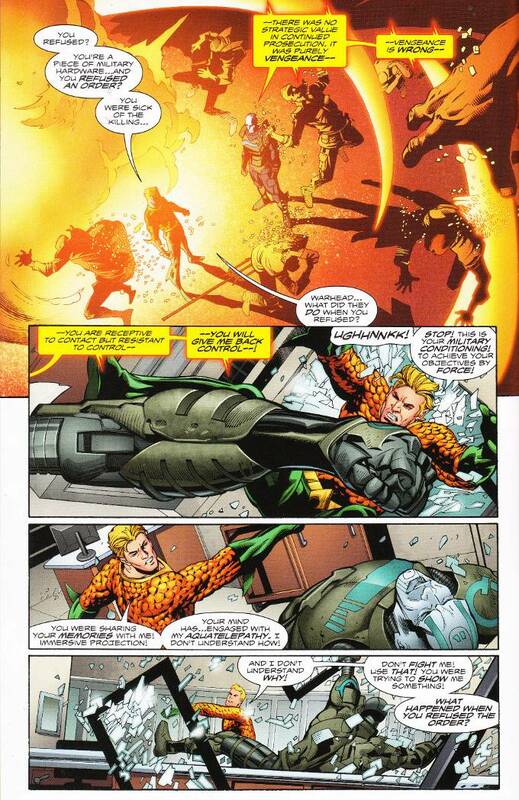 Aquaman confronts the living weapon known as Warhead, discovering the creature's horrific past and what caused it to break its programming. Somehow, the telepathic construct that sows conflict around it has tapped into his telepathy, making every memory as painfully real to Arthur Curry as it is to him. Can Aquaman overcome this most unusual foe? Dan Abnett is to be commended for having crafted one of the most unique and original characters in recent comics history. Though the ideas put forth in this issue are born of classic science-fiction, the conceit of confronting the classic questions of whether or not artificial intelligence constitutes an actual soul have never been dealt with in this precise manner to my knowledge. Pairing this character up with Aquaman, whose powers make him uniquely emphatic while still being a warrior, proves an equally brilliant conceit. The art for this issue matches Abnett's script in complexity and thoughtfulness. Scot Eaton, Wayne Faucher and Gabe Eltaeb are one of the strongest power trios among all the artist/inker/colorist teams working today. Every page of this issue is a testament to their skills as individual artists and as a group.